"A marvelous collection, put together by the foremost authority on John C. Calhoun, and an absolutely essential book for the study of the great South Carolina statesman and political philosopher! Professor Wilson's extraordinary introduction and selection of materials reflect his vast knowledge of the history of the scholarship on Calhoun and the various ways in which he is still oversimplified by those who have passionate opinion about his work but have never read him. Also a valuable introduction to the great debates which foreshadow the War between the States. As much of Calhoun as may be usefully gathered in one volume!" "Wilson... [provides a] portrait of the man, both through correspondence to friends and family and in the final section, Calhoun "on himself..".. [M]ost satisfying and interesting." "Professor Clyde Wilson. . . has compiled a magnificent anthology which will endure as long as Americans are interested in close reasoning about the nature of government and society. He has drawn on a rich lode of documents from Calhoun's hand, including several thousand surviving letters. . . . The Essential Calhoun is likely to have a strong and lasting impact on students of politics and society who are truly dedicated to underlying truth, who genuinely endeavor to understand why American society has become a collapsing society and why American government no longer serves the interests of the American people." "Wilson... presents a thoughtful and well-organized appeal to historians to go beyond what he considers simplistic views of Calhoun repeated in the past and to general readers to consider Calhon's positions in light of present-day events. . . . General readers will find Calhoun's commetns on the Constitution and the American political process enlightening." "It seems incredible that we had to wait so long for a book like this. . . . Only Wilson could have provided the inspired selection and organization of the materials." "In the riches of the expertly edited collection, the reader encounters perhaps the greatest mind among America's statesmen. . . . Wilson merits high praise for a varied and well-rounded selection, complete with illuminating introductory comments." "Few figures in American political history have displayed the broad learning and creative imagination of John C. Calhoun, and few remain as relevant today to enduring questions of power and freedom, law and democracy, diplomacy and war, economy and culture. Clyde Wilson's anthology of Calhoun's writings admirably captures his genius and makes his teaching available once more to a modern generation." 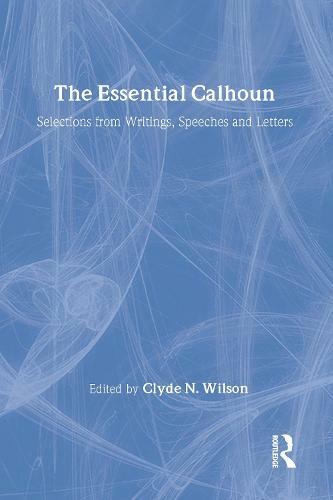 "The Essential Calhoun is the broadest and most widely ranging selection of John Caldwell Calhoun's writings that has ever appeared between two covers. There are many discoveries and surprises here for the professional as well as the student." "In compiling The Essential Calhoun, Clyde N. Wilson has done a masterful job. As we might expect of the man who has devoted much of his career to editing The Papers of John C. Calhoun, Wilson has presented us with a fine set of selections, making easily available to us the most important features of Calhoun's thought."